This Victorinox product stands for quality! The compact plastic Swiss card incorporates a multitude of essential tools, and can also be used as a ruler (7.5 cm and 3 inches). 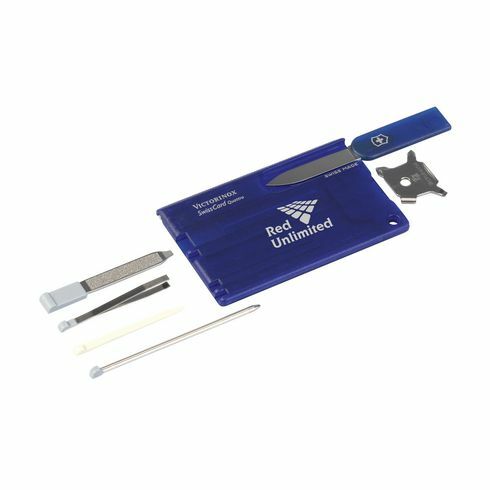 Easy to fit in the credit card slot of your wallet, you will always have the right tools at your fingertips. Meas. 8.1 x 5.3 x 0.4 cm. A luxury yet practical gift item, packed in a specially designed holder with a clear product description, meas. including holder 12 x 12 x 0.7 cm. With lifetime guarantee. With 4 part screwdriver, knife, nail file with screwdriver, toothpick, tweezers, ballpoint and straight pin. 75 g.